I've been teasing you about my upcoming digital cookbook for ages, and I'm delighted to let you know that it is coming very soon. This cover is so hot off the presses that it isn't even posted on Amazon yet! 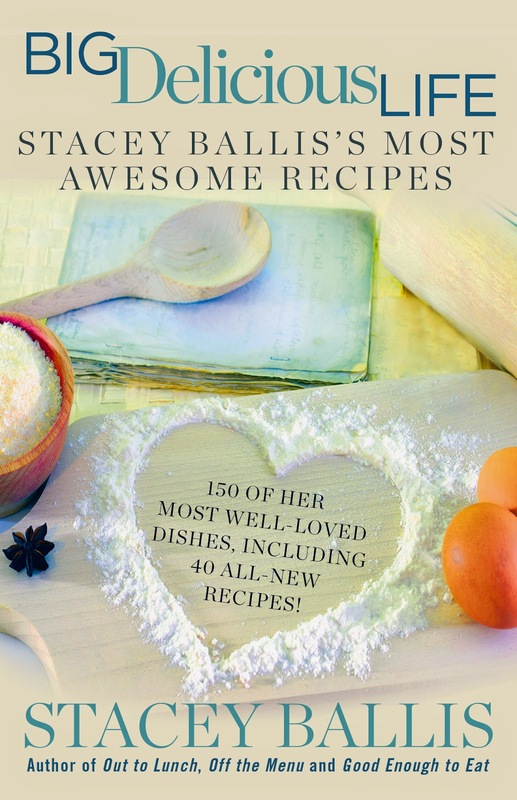 Big Delicious Life is a digital collection of 150 recipes from my novels, including 40 recipes that had to be cut from the original books for space considerations. Even better, because it is digital, it is a recipe resource you can keep in your pocket on your phone or tablet, perfect for those moments you are at the grocery store and don't know what to make for dinner! I love having recipes on the go when I'm traveling or staying with pals, and there is something for everyone in here. The absolute best part? In a day and age when a new cookbook will run you anywhere from $25-$65? Big Delicious Life is $3.79. BOOM. I've had such wonderful feedback from you all about cooking from the books, and I know what a pain it is to have to go searching through multiple books to find a recipe, so I really wanted to make all of them available in one super-convenient format, and at a price that makes it a real value, and an easy fun gift. We're talking like 2 1/2 cents a recipe, people! I spent a lot of time working on the indexing, so there are actually two ways to navigate, you can find recipes from a specific novel, but I've also indexed them based on ingredients, so if you are staring at a package of chicken in your fridge and don't know what to do with it, you can get all the chicken recipes in a flash. It is currently available for pre-order and will be delivered to your E-Reader on October 21, in time for all of your holiday menu planning. I'm very proud of it, and can't wait to hear how you all like it. Also? It includes a chapter (and a recipe) from my upcoming new novel Recipe for Disaster just to whet your appetites. I'm finally getting my head above water! I'm delighted to announce that I've finished the revisions on my new book, and I really really think you are going to like it. 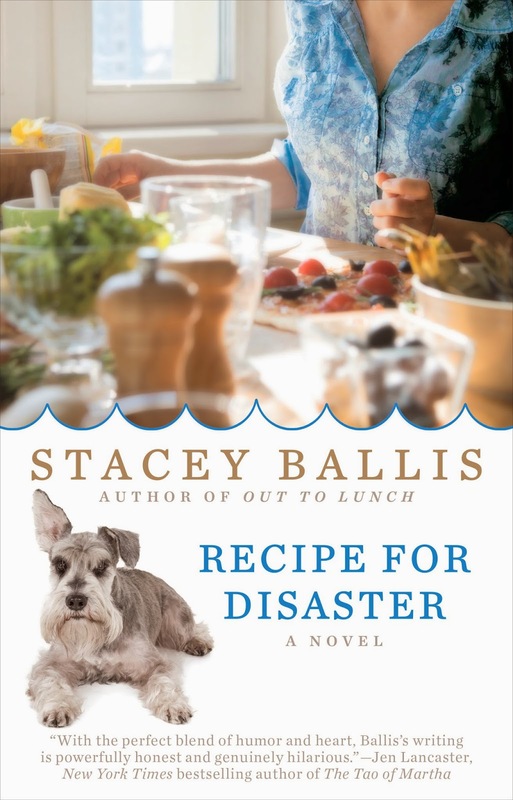 Recipe for Disaster is the story of a contractor whose life blows up around her, forcing her to live in the half-finished ruin of her current renovation with a miniature schnauzer that hates her. I'm very excited about it, and there are plenty of new recipes as well! Luckily for us, our own renovations are moving along without disaster! We officially have a completed concrete pour in the basement, so no more dirt floor. We are waiting for it to cure for 28 days so that we can polish it. Once that happens, it's time for fun things like, you know, WALLS! I have a feeling that once we start to see some framing, things are going to move very quickly, so get ready for a Fall full of updates. In the meantime, I thought I would share some of the unexpected pitfalls of doing such a renovation. When you know that more square footage is imminent? It can become tricky not to purchase things for the "future house" as opposed to the "current house". This is where what used to be a casual flirtation with Craigslist can turn into a dangerous full-fledged affair. Case in point, the recent Hall Mirrorpalooza (which Charming Suitor might refer to as a Debacle). I have wanted a built-in antique pier mirror for the foyer for the longest time. It is appropriate to the time period of the building, and I have always thought it would make for a wonderful addition. Of course, salvaged genuine antiques of the right age have had three things working against me. One? They are very often terribly ornate, carved, gilded items, which certainly hits a Princess where she lives, but CS is viscerally opposed to things that are overly "decorative", being more of an Arts and Crafts/Prairie kind of guy, so the fancy ones are right out. Two? Even non-fancy ones are CRAZY expensive, ranging in my research from an almost-reasonable $1500 to a "are-you-effing-kidding-me?" $27,000. And no, that is not a typo. Three? They are very often far far away, on the East Coast. Or France. And shipping costs for an item like this from NY to Chicago can be a thousand bucks or more and you don't even want to think about overseas shipping. Um? No. I've been looking around for one of these things for the better part of two years to no avail. So you can imagine when I spotted this on Craiglist, it caught my attention. 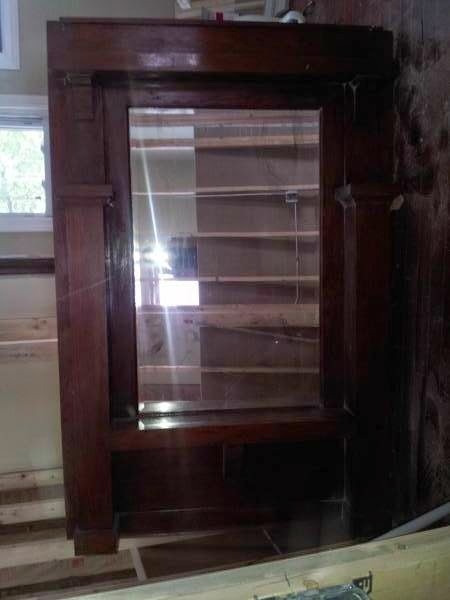 Hard to see, I know, but not overly ornate, mirror in nice condition, and the style and finish of the woodwork is very much in line with the existing woodwork in our house. I looked at the measurements. I measured the wall in the foyer. With very little adjustment, it will fit like a glove. I show it to Charming Suitor who likes it. I email the seller, yes it is still available, pretty close to our house, and yes, there is wiggle room on price. When we arrived at the house to see it, the owner mentioned that he is converting a two-flat into a single family home, so this is salvaged from that property. "Oh," he says. "And there are two of them, so you can pick which one you like more." My heart leapt. Behind me I heard CS mutter. "F***." Because he knows me, and he knows that unless one of the two of these is harboring a family of venomous spidersnakes, I'm gonna want them both. Because, TWO! TWO! TWO MIRRORS IN ONE! They were both perfect. Solid as a rock. Mirrors beveled, and just the tiniest bit speckled in a way that lets you know they are over 100 years old. All the moldings intact, original finish with plenty of patina. I batted my eyelashes. I gave my most winning smile. And CS said, "You negotiate it." I offered the guy $600 for both. And he came back with an offer of "Absolutely, get them out of my garage." We decided that the second one will eventually get installed in our master bedroom to serve as a cool full-length mirror. Of course, we are still a long way of being able to install either of them ANYWHERE, so for the moment? They live in the dining room. Along with the eventual vanity for the basement bathroom, and the eventual basement bathroom sink. And all of our dining room furniture. All of the rest of the stuff I've found for the "future house" like a pair of repro Louis VIV chairs, and an Arts and Crafts desk, and four really cool art nouveau iron folding chairs...not to mention all of the stuff we took out of CS's bungalow now that we have sold it. 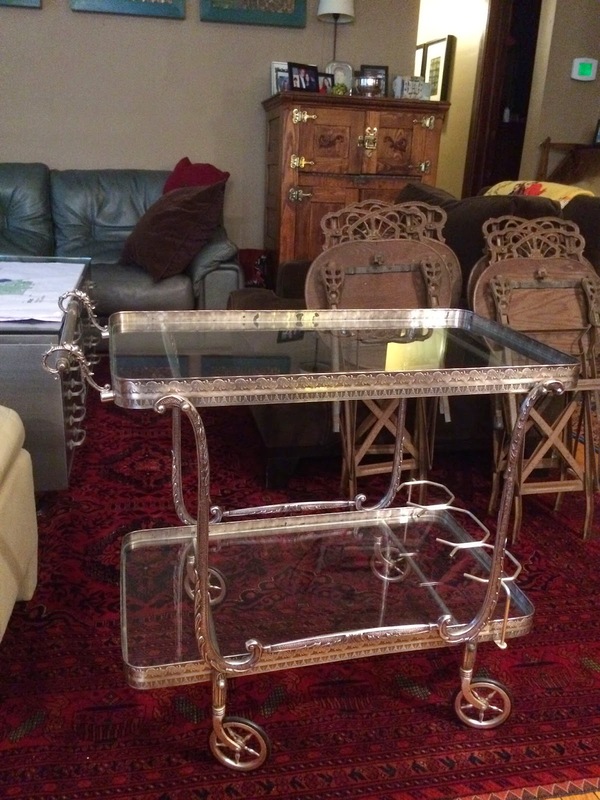 And THIS BAR CART! How could I not? 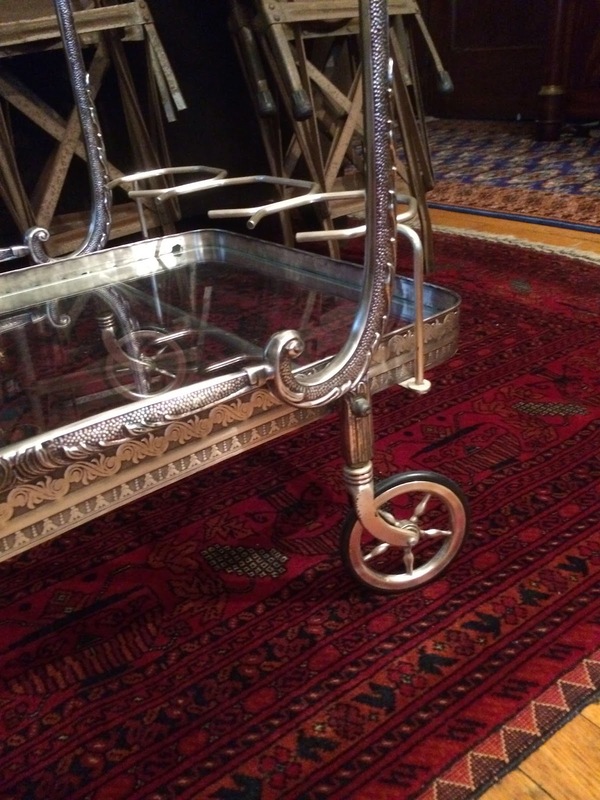 It's Italian, 1920s, it's SILVERPLATE! Look at the WHEELS!!! I know. Its a sickness. Our formerly lovely dining room for dinner parties now looks like one of those storage units on Garage Gold, and when people come over, its all "how much fun to eat pizza on your lap in the living room!" party. CS had to put me on a strict "No Craigslist till some new square footage is actually finished." moratorium. Luckily, we only have to live like a Hoarders episode for another month or so, because when our second floor tenants vacate mid-October, we will move it all up there while we finish the renovations down here. Stay tuned for more updates coming soon, there are a couple of exciting announcements to be revealed in the coming weeks!